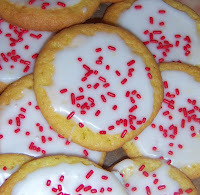 Last summer, I blogged about a cookie I've wanted to make for quite some time. 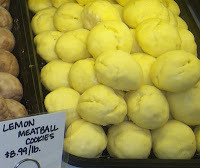 In Rochester, they are called Lemon Meatball Cookies. They have a wonderful melt-in-your mouth texture -- not cake-y, not crumbly, not chewy. My favorite spot to buy them is at Bernunzio's Deli in Penfield, but I'm told they are sold at other bakeries in Rochester. Since I was going to a cookie exchange this week in which we were to bring six dozen cookies, I thought it would be a good chance to try some recipes to see if I could get closer to the recipe. The cookie on the left was a traditional lemon cookie called Aginoretti. These looked right but they weren't as sweet or tender as the lemon meatballs. The one in the middle was based on Paula Deen's Lemon Blossoms, which have lemon cake mix in them and are made in mini muffin cups. When I made the original recipe, they imploded in the muffin cups, so I'm not sure why I thought they might stay shaped like a ball when I made them into balls and baked them. Duh -- they ended up flat as pancakes. 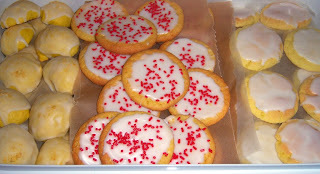 On the right are Easy Glazed Lemon Cookies, which I concocted from a few recipes on the Web. These were lemony and chewy -- the favorites of everyone who tasted the three cookies -- but they still weren't the cookies I was going for. And oh, by the way, they were based on a cake mix, so they were very easy. At that point, I thought I might be out of luck when it came to making meatball cookies at home. 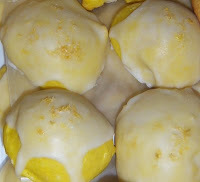 As luck would have it, a lovely person named Jeannie posted a recipe in the comments for my original post about lemon meatball cookies. It sounds promising, and I'm definitely going to give the recipe a try soon. 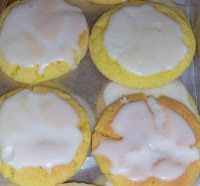 In the meantime, I'm sending the best cookie of the bunch -- the Easy Glazed Lemon Cookies -- to Foodblogga for inclusion in her 2nd annual Christmas Cookie Roundup. This blogging event is incredible in it size -- last year she had dozens (hundreds?) of cookie submissions from all over the world. If you want a great source for cookie ideas, the roundup, which will continue to accumulate until December 24, is here. These cookies are traditional Italian cookies, cakey but somewhat dry, and not very sweet. Cream together sugar and shortening. Add eggs and lemon extract and beat well. Add flour, baking powder and salt. Add food coloring, if desired. Mix well. The dough should be soft and sticky. With a small cookie scoop (mine is about 1 Tablespoon), form balls. Drop balls on greased or parchment-lined cookie sheets, spaced2 inches apart. Bake for about 12-15 minutes, or until firm and lightly brown. Remove cookies from cookie sheet and allow to cool completely on wire racks. Glaze as directed below. Store in an airtight container. If you want to freeze the cookies, freeze unfrosted and frost once thawed. Combine the cake mix, pudding mix, eggs, oil, and lemon zest and blend well with an electric mixer until smooth, about 2 minutes. Refrigerate about 30 minutes so that the dough is easier to work with. Use a small cookie scoop (mine is about 1 Tablespoon) to form balls. Drop balls on greased or parchment-lined cookie sheets, spaced 3 inches apart. Bake for 8-10 minutes or until golden brown around the edges. Cool completely on a cooling rack. Glaze as directed below. These turn out flat and chewy, with a crackly top. They pack a powerful lemon punch but aren't overly tart or sweet. Combine cake mix, eggs, oil, lemon extract, and lemon zest in a large bowl. Mix with an electric mixer until well blended. Refrigerate about 1 hour, until no longer sticky. Use a small cookie scoop (mine is about 1 Tablespoon) to form balls. Drop balls on parchment-lined cookie sheets, spaced 3 inches apart. Bake for 11 - 15 minutes. The bottoms will be light brown and the insides chewy. Cool, then glaze as directed below. Makes about 36 cookies. Combine the confectioner's sugar and lemon juice. Mix with a whisk until smooth. For the two cake mix cookies, the mixture should be somewhat thick -- about the consistency of Elmer's glue. For the Anginetti, it should be thinner, like heavy cream. If it is too thick, add milk, a few drops at a time. If it is too thin, add a little more confectioners sugar. For the cake mix cookies, use a spoon (like a cereal spoon) to drop the glaze on the cookie, then spread around with the back of the spoon. Leave a little border, as the glaze will spread. Sprinkle with jimmies or nonpareils, if desired. For the Anginetti, put the cookies on the rack and use a spoon to drizzle the cookies with the glaze. All three of these look absolutely delicious to me! I hope you're able to find the exact recipe you're looking for, but I'll be happy with these. I love cookie exchanges! Rochester is so close, but yet still so far but would have loved to been a part of YOUR cookie exchange! I love lemon cookies so all three would work for me. If you find the meatball cookie you are looking for, please post as it sounds awesome. I still have to do my Italian Cookie recipe. I dont know if it is what you are looking for. These all look very good. My husband has been looking for THE Ginette recipe. His family has always called them "ginettes" but they are a version of anginetti. However, all the anginetti recipes I've tried are not dense enough and not doughy enough, per his recollection from family dinners past. And to top it off, it sounds like the Rochester meatball cookie sounds about right! I still can't believe after all my time in Rochacha I never had a lemon meatball cookie! PLEASE LET me know how the recipe (previously posted for you) works out. I'd love to find out what you think! Good luck with recipe testing!